You'd have to be living underneath an internet rock to not have noticed Ta-Nehisi Coates' "The Case For Reparations" in The Atlantic circulating this week. However, a Michigan congressman who has been making the case for reparations since taking office in 1964 is staring down an abrupt end to his career. But Conyers is still an icon of the civil rights movement, taking office at a time when few politicians of color made their way up the ranks. And one of his many passions is bill HR 40, which would fully acknowledge the centuries-long injustices against African-Americans. Conyers has pushed for HR 40 to become law since 1989, something Coates discusses at length in the must-read "Reparations" piece. John Conyers's HR 40 is the vehicle for that hearing. No one can know what would come out of such a debate. Perhaps no number can fully capture the multi-century plunder of black people in America. Perhaps the number is so large that it can't be imagined, let alone calculated and dispensed. But I believe that wrestling publicly with these questions matters as much as—if not more than—the specific answers that might be produced. Conyers' later years have been marked with spectacular mishaps despite his earned stature. His wife, a former Detroit city councilwoman, was sentenced to prison for corruption. His son had $30,000 stolen from a government-owned Escalade he wasn't supposed to be driving. And now this: Signatures collected for Conyers' allowance to run for a 26th term in office have been disqualified for a number of reasons. For one, one of Conyers' petition workers turned out to be a fugitive from the law, not showing for a court appearance on an assault and battery charge and failing to fulfill probation requirements on a home-invasion conviction. Michigan law requires those collecting signatures for a petition to be registered voters. 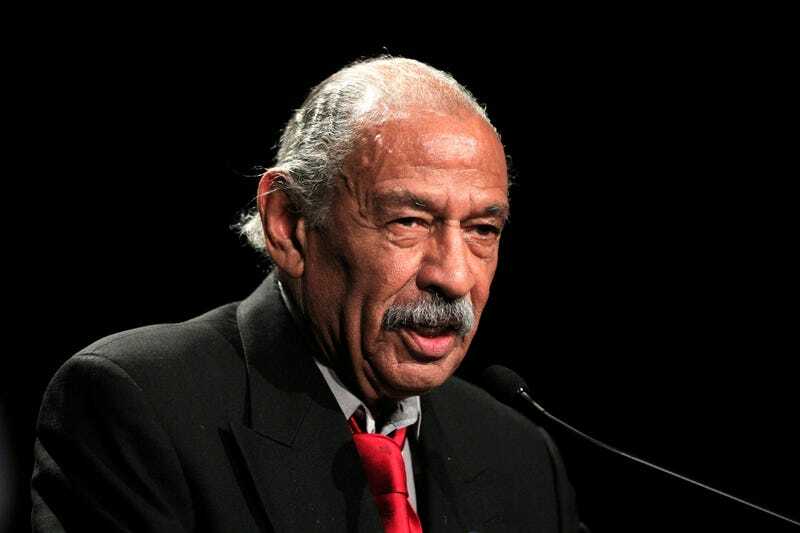 Next, after several reviews of the signatures that were collected, officials determined that Conyers did not meet the minimum 1,000 required to appear on the August ballot because more than half of those who signed were not properly registered or had other foul-ups, like mismatched addresses or misdated petitions. The final blow to Conyers' campaign came from Michigan's Secretary of State, who made the determination after the Wayne County clerk also deemed Conyers ineligible earlier this month. Conyers is left with two options: Run as a write-in candidate or gracefully bow out. His challenger, a prominent local pastor whose daughter is a city councilwoman (Detroit! Nepotism! The never-ending stronghold of the black church on politics! ), was charged with domestic violence against his wife a few months ago. UPDATE: A federal judge just — literally a few hours after the original strikedown — put Conyers back on the ballot, which means now convincing the voting public that this whole thing was just a misunderstanding.